Some fish and chip shops are really very bad indeed. Some are just mediocre, and fail because of their mediocrity. Some are quite sensational. Others are part of a tradition or a routine, and are important because of that. The Old Keswickian fits into both of the last two categories. A visit to The Old Keswickian is as much a part of a trip to the Lakes as throwing stones into Derwentwater is for the kids. To visit Keswick without visiting The Old Keswickian just wouldn’t do, and there’s good reason for this. The fish and chips are extraordinarily good. The fish in particular is first rate – thick fillets of haddock fried in a substantial batter, the fish moist, the batter crisp and crunchy. The chips are fresh and hot, crisp on the outside, fluffy in the middle, which is all I need from a chip. Everything is prepared with a confident and expert air. The fish fryer sweeps salt and vinegar across each portion with a neat and quick figure of eight motion, a smooth and practised movement that’s almost hypnotic. This isn’t a cheap fish and chip shop. The price of fish and chips nudges a fiver, but this doesn’t matter when the food is this good. Your language is eloquent but I can honestly say I doubt that you have ever had fish and chips from their take away. The chips are dry, hard and tasteless, and it’s common to drop some because the carton is a small chip carton so with the fish on it’s overflowing. 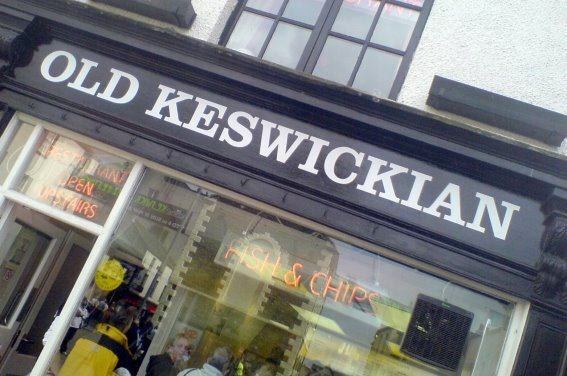 There are cheaper fish and chips in Keswick, and they are MUCH tastier too. Beware if you complain to the owner though, he is rude and insulting.